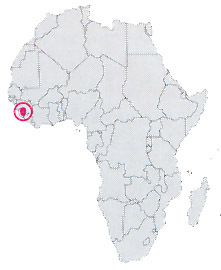 Country of the western Africa between Guinea and Liberia, torn with civil wars that have prevented the start of every program of economic and social development since many years. In this situation the state is very poor, the commercial balance marks heavy losses, the foreign indebtedness is very high, the annual inflation exceeds the 35%. The population is in an extremely critical situation, one need only consider that of the almost 5 millions of inhabitants, the 64% is illiterate and the 68% lives in absolute poverty.